Kun Shoulder rests are very easy to use, and many come fully assembled. Aside from the mechanics of adjusting the rest, though, how you use it will be personal since each of us has such different anatomy. In that sense, there isn’t a single ‘correct’ position. Shoulder rests are ergonomic so it’s essential that you find the most comfortable position for your neck, shoulder and back while making sure you maintain good overall alignment. If you’re unsure, ask a teacher or other professional for help and tips. Here’s the violinist and vocalist Lizzie Ball explaining how to assemble your Kun rest; written instructions follow. While many Kun rests come fully assembled, the exceptions are the models that do not collapse: the Kun Original and Super rests. With these models, you’ll need to remove the T-shaped over-moulded ‘feet ‘from the box and insert them in the L-shaped end members. The foot with the shorter brass screw goes into the L-shaped end member on the wider end of the rest, which sits on your shoulder. The foot with the longer screw goes into the end member on the rest’s narrow which the tapers onto your chest. The Kun Solo: while the Solo rest comes assembled, you might need to replace the feet at some point. 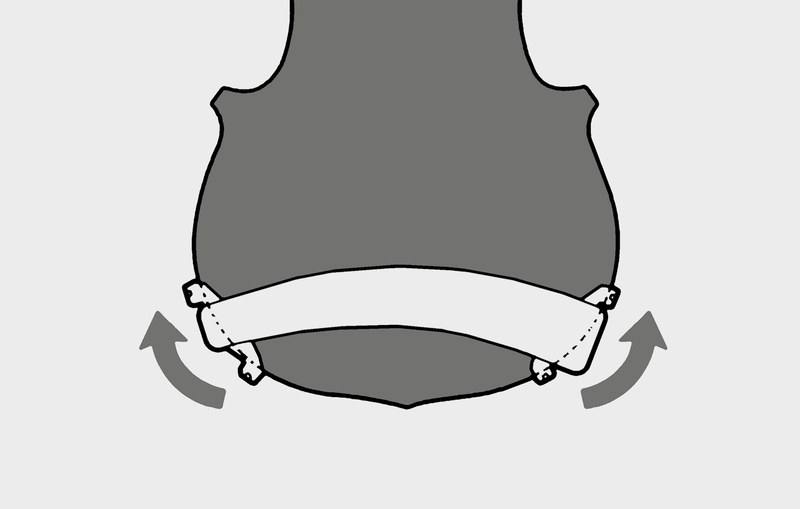 When doing so, it is very important that you use one hand to hold the recessed drum firmly on either side, while the other hand screws in the foot. If you don’t, it will be difficult for the threads on the screw to catch on the threads in the shaft into which it’s being inserted. The Kun Original: the T-shaped feet on this model should not be removed to make the rest fit into your instrument case. 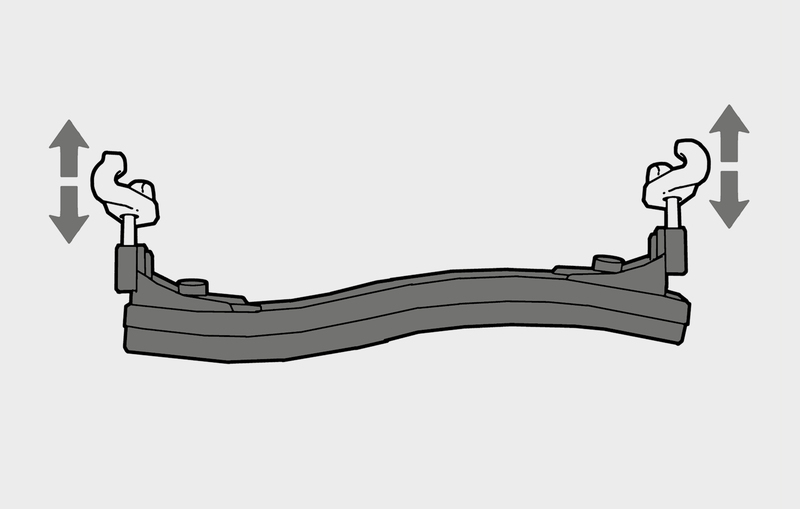 Regularly pulling the foot and round drum out of the L-shaped end member and then reinserting it weakens the composite plastic from which the shoulder rest is made and can damage the shoulder rest. If you need a more compact rest, try the Kun Collapsible or Solo model which fold for easy storage. Here Lizzie Ball explains how to adjust your Kun shoulder rest; written instructions follow. https://youtu.be/-B4jgnyAasY Kun rests adjust in three directions. To adjust the height of your shoulder rest, simply turn the screws in the T-shaped fork members. Be sure to leave adequate clearance between the lateral adjusting mechanism and the back of your instrument. If you want to raise your shoulder rest higher than these screws allow, try switching to the ‘extra-long screw.’ To use it, remove the shorter of the two standard screws and put it aside. Move the longer screw to the wide end of the shoulder rest. Then insert the extra-long screw in the narrow end of the shoulder rest. Extra-long screws are available as spare parts; to find one, contact your local Kun supplier. If you’re having trouble locating one, let us know. To adjust the width of these Kun rests, you’ll need to move the L-shaped ‘end members’ along the elongated base member. To do so, simply remove the nut that fastens the end member to the base, move the end member into the position you prefer, and fasten again with the nut. There are two lateral adjustment options: 1. remove the brass screw from the narrow end of the shoulder rest. Slide this L-shaped bracket to the width you’d prefer and refasten the screw. 2. use the T-shaped fork member to remove the insert with its offset hole from the wide end of the shoulder rest. Turn this insert 180 degrees and insert it back in the shoulder rest. Use your thumb to release the quick adjust lever on the end member. 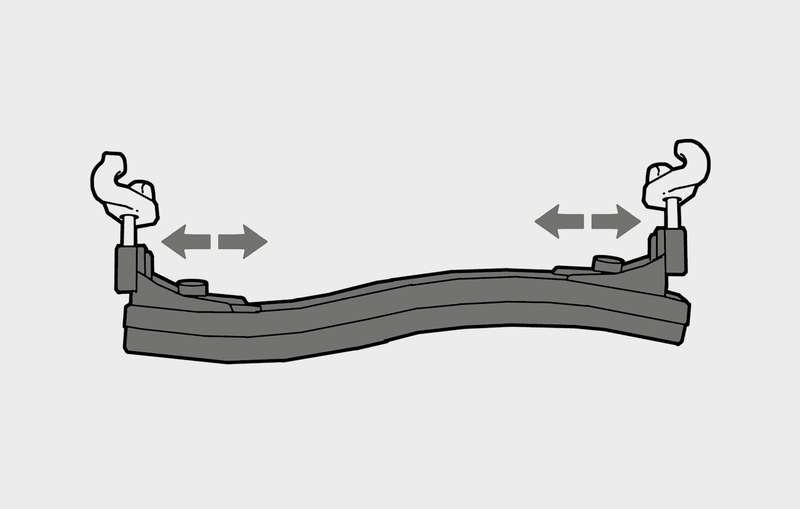 Slide the end member into the position you prefer, and close the lever. And finally here Lizzie Ball describes the best way to place your shoulder rest on your instrument; written instructions follow. The safest way to install your Kun shoulder rest on your violin or viola is by carefully sliding it onto the lower bout of your instrument until you reach the desired position. Some musicians prefer to position the shoulder rest quite high on the instrument’s lower bout, away from its waist. Those players might benefit from our patented offset forks, which grip further down the bout while allowing the shoulder rest to sit closer to the chin rest. Kun offset forks come with our Voce model, but they are also available as a spare part. Contact your local Kun supplier to order a set. If you’re having trouble finding them, let us know. Please note that these forks are only available for full-sized instruments.